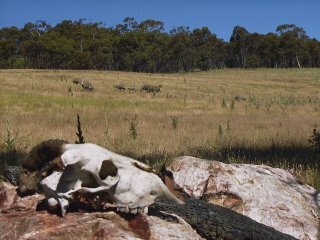 26-Dec-2000 -- I was not surprised to find that this confluence occurs in a sheep paddock - in rural Australia it was likely to be a wheatfield or a sheep paddock! Fortunately it is only 100 metres of the road. Photo #1: 36S 149E is 100m off the public road, but since the sheep weren't too concerned, I decided to step over the low fence to take some photographs for my first planned confluence visit. I tried to get the sheep to agree to be witnesses to my visit, but they bleated about putting their lives at risk and pointed out the fate of some of their kin who had "talked." Photo #2: Will this Grassy Knoll become as famous as "THE" other one ? It seems that the only regular visitors to 36S 149E are these Australian Merino sheep. Photo #3: Since there wasn't much else movable around, I decided to use the two sheep-skulls placed back-to-back as a marker of my visit. Photo #4: I am using a Garmin GPSIII+ and it was showing an EPE of 5 metres so I am confident I am quite close. Photo #7: There are two ways to approach 36S 149E assuming you are travelling from Canberra. The easiest on your car is to travel to Cooma and then head towards Adaminaby and then turn right. I took a short-cut by turning right 7 km south of Bredbo onto a good dirt road, keep straight ahead when you see a turn-off to the left. Turn right towards Shannon's Flat when you reach a T-intersection. 36S 149E is 4.4 km north of this intersection. Photo #8: There is also a back road to Canberra which is even shorter in distance. It is mainly unsealed dirt but of good quality and you can travel at 8 0 km/h for most of it - the views are certainly worth it ! To return via this back road turn right 10km north of 36S 149E, which is 800m north of Shannon's Flat (one house and one telephone exchange). Travelling at night on this road mightn't be a good idea, otherwise you might kill Fatso's (the unofficial Sydney Olympics mascot) relatives like this one I came across -- no, I definitely did not run into him! #1: Sheep and their skulls. #5: A panoramic shot looking east.